The Great Barrier Reef is one of the world’s most iconic destinations for travellers. Comprising of over 2,900 individual reefs and 900 islands, with 600 types of soft and hard corals, more than 100 species of jellyfish, 3000 varieties of molluscs, 500 species of worms, 1625 types of fish, 133 varieties of sharks and rays, and more than 30 species of whales and dolphins, it is by far one of the most complex natural ecosystems in the world! It is also one of the Seven Natural Wonders of the World, a UNESCO World Heritage Site and it is the world's biggest structure made out of living species. In 1981 the Great Barrier Reef was inscribed on the World Heritage List for its unique natural properties and enormous scientific and environmental importance. Many of the species living in the reef are endangered and some are endemic only to that reef system. Situated in the Coral Sea, on Australia's north-eastern coast, the Great Barrier Reef stretches more than 2300km, beginning in the Gulf of Papua to Australia's north, and extending south to the Bundaberg area. It is the only living structure that can seen from outer space. Cairns is located in Tropical North Queensland, and is known as the 'Gateway to the Great Barrier Reef', being the closest departure point for reef cruises to the outer barrier reef. 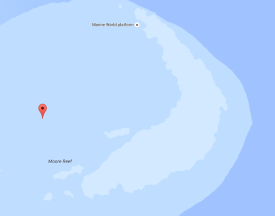 Travel time to the outer barrier reef takes just 90 minutes by boat, or a 30 minute helicopter flight. If you want to see a tropical island then Green Island and Fitzroy Island are just a 45 minute boat ride away. Tropical North Queensland is also the only place in the world where two world heritage sites sit side by side - the magnificent Daintree Rainforest and the Great Barrier Reef. Located 110km north of Cairns, the Daintree National Park is a stunning area of tropical rainforest wilderness, where you can view fringing reefs along the Cape Tribulation coastline. 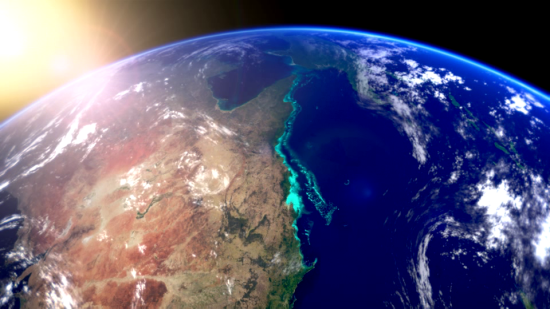 The Great Barrier Reef, in its most modern form is only 8,000 years old, having developed after the last ice age. The reefs we see today have grown on top of older reef platforms, comprising of hundreds of coral reefs separated by deep water channels. 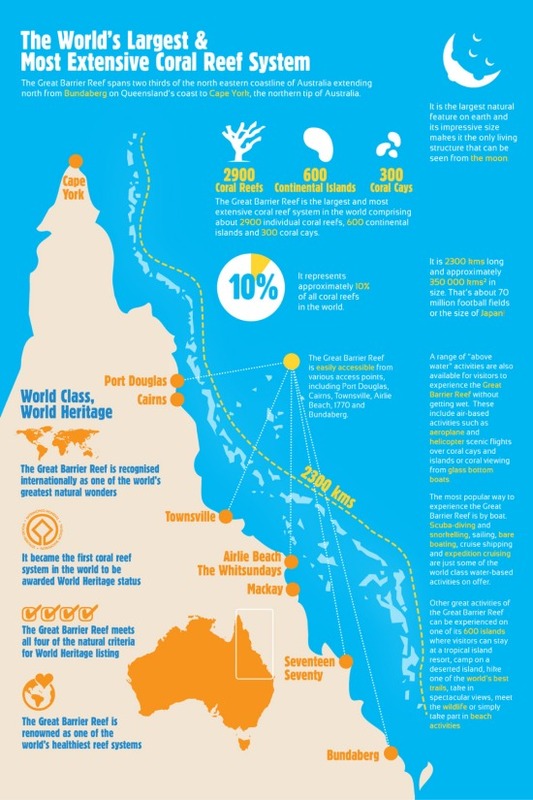 Aboriginal and Torres Strait Islander people are the Traditional Owners of the Great Barrier Reef region. For over 60,000 years their traditional connections have been part of the unique living maritime culture, and today their traditional customs and spiritual lore continue to be practiced in their use of sea country and natural resources. 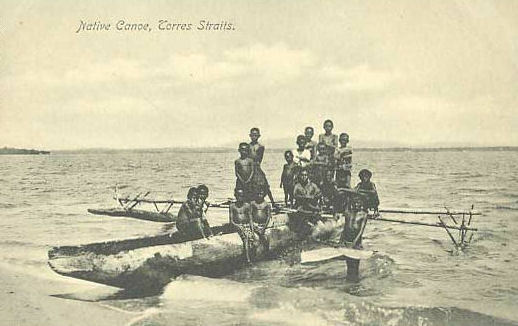 As sea-faring people, Torres Strait Islanders travelled through the reef’s waters for trade with mainland Aboriginal groups along the east coast, as well as to collect resources for their subsistence lifestyles. To do this they travelled vast distances in outrigger canoes, using the wind, with only the constellations as navigation guides. Their myths and legends of the sea are expressed through dance and song and there are many creation stories for the region’s islands and reefs. The colonisation of Australia after 1788 led to major changes in Aboriginal and Torres Strait Islander societies, cultures, lifestyles and use of sea countries. 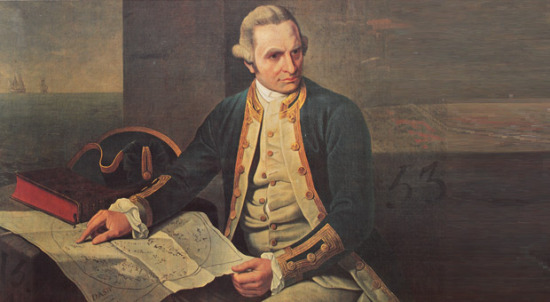 English explorer and naval officer Captain James Cook discovered the Great Barrier Reef on 11 June 1770 by sudden impact. In his journals, Cook described striking the south-eastern end of what is now named Endeavour Reef at 11pm, after having passed just north of Pickersgill Reef about one hour before. As a result of his misfortune Cook named features in this area with sombre names "Cape Tribulation because here begun all our troubles" and the mountain behind it Mount Sorrow. James Cook and his crew were forced to stay on the banks of the Endeavour River for 48 days, while repairs were carried out on the beach (near the docks of modern Cooktown, at the mouth of the Endeavour River). A search of the wreck area in in 1969 discovered six abandoned cannons, ballast and an anchor which was discarded by the crew of the Endeavour when attempting to re float the ship. One of these cannons is on display at the Australian National Maritime Museum in Darling Harbor, Sydney. After extensive repairs, it took Cook and his crew three months to navigate through the maze-like construction of the Great Barrier Reef. These obstacles did not discourage Cook from exploring and charting the extent of the Reef and its cays, passages, and other intricacies on this first of three expeditions of discovery he undertook to the Reef. 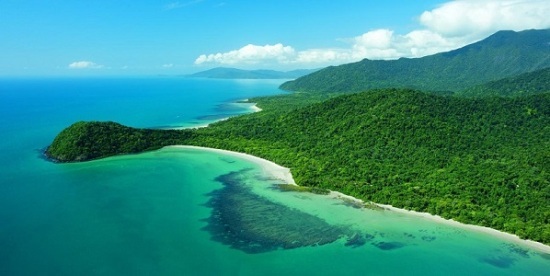 The striking of the reef off the coast of Cape Tribulation is a significant moment in Australia’s history. Had the Endeavour sunk at that time, Cook may not have later laid claim to Australia's east coast. Explore the Great Barrier Reef from your lounge room! The Catlin Seaview Survey is a world first global study dedicated to monitoring the world's reefs. The survey commenced in September 2012, with the team surveying 32 reefs along the entire stretch of the Great Barrier Reef and out to the Coral Sea. In total 150km of reef was surveyed using a specially designed underwater camera, the SVII, to capture photos and footage. Google has partnered with the Catlin Seaview Survey make these amazing underwater panoramic images available to millions of people through the Street View feature of Google Maps. With these vibrant and stunning photos you don't have to be a scuba diver—or even know how to swim—to explore the Great Barrier Reef! Explore high-resolution, 360-degree images of the reef. Currently there are 16 local sites documented in the Far North to discover in 360-degree surrounds, including Lizard Island, Norman Reef and Osprey Reef in the Coral Sea. 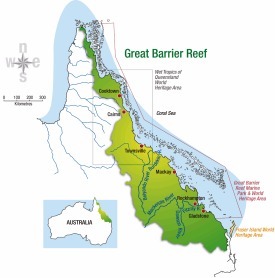 The Great Barrier Reef is located along Australia's north-eastern coast, stretching more than 2,300km from the tip of Cape York Peninsula in the north to Bundaberg in the south. 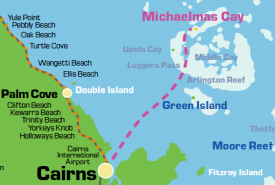 Cairns is the closest departure point for reef cruises to the outer barrier reef. 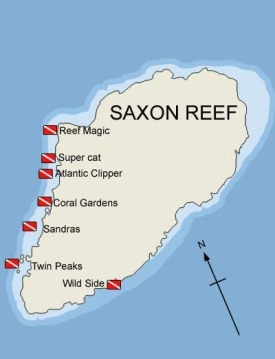 Saxon Reef is an excellent coral location with a good balance of shallow reef and deep water. The white sandy floor reflects the light and on a sunny day turns the whole area into a classic magical reef scene. Swim throughs and gullies are scattered throughout the reef with perfect shallow snorkelling over the bommie tops. 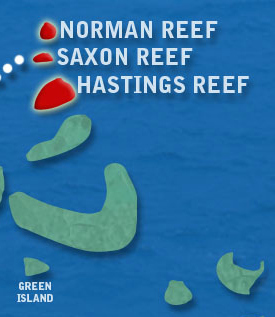 Hastings Reef is located 30 nautical miles out from Cairns. It features an impressive clam garden and stag horn corals. Great for snorkelling as you can float just on top of the reef watching sweet lips, trumpet fish and impressive parrotfish. Thetford Reef is home to many soft and hard corals like staghorn and plate coral and an abundance of marine life. Here you can experience some very exciting wall dives and many swim throughs. Look for the giant clams, butterfly fish, damsels and angelfish. 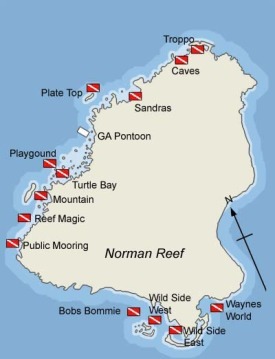 Flynn reef a popular dive location with Pro Dive. They have moorings at a number of the well known dive sites around this reef offering excellent wall dives, swim-throughs, overhangs and night diving. Expect to see an abundance of marine life and plenty of hard corals such as staghorn, table, plate and boulder coral heads. Milln reef offers excellent wall dives and swim throughs and is great for night diving. Some of the walls are full of sleeping parrot fish in their mucus sacks, turtles and barracudas and the occasional bull ray. Whale bommie provides you with a good dive in depths exceeding 20 metres. 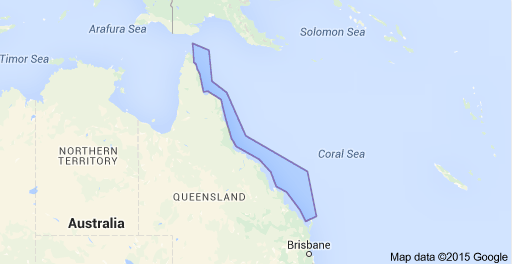 Moore Reef is located approx 45km offshore from Cairns. Reef Magic Cruises and Sunlover Cruises activity platforms are located here. Moore Reef provides excellent all weather protection. Enjoy classic wall diving, swim throughs and isolated bommies. Breaking Patches is a small reef location just north of Michaelmas Cay. Reef Encounter, Reef Experience & Compass Cruises have exclusive rights to Breaking Patches. Famous for its friendly turtles, Breaking Patches is also home to both hard and soft corals, with several great swim-throughs. 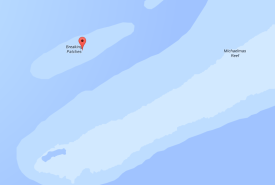 Pellowe Reef is a small isolated reef that visited by Silverwswift & Pro Dive. The reef drops away very quickly at places to 30 metres. The majority of dives are usually between 5 to 20 metres. Being closer to the shelf large pelagic fish can be sighted along with the more regular sightings of schools of chevron barracuda, numerous sea cucumbers and nudibranchs. Norman Reef is located 70km off Cairns and is a popular destination for day and liveaboard reef trips. Perfect for novice divers and snorkellers, expect to see a great variety of fish life, pelagics, turtles, coral gardens, swim throughs, caves and giant clams. The resident Giant Maori Wrasse named “Wally” often comes in close to say hello! Michaelmas Cay is the largest of three sand coral cays, and is a national sanctuary and home to over 20,000 marine birds. 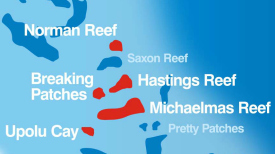 Michaelmas Cay offers excellent snorkelling, perfect for beginners as you can snorkel straight off the beach. Marine turtles and stingrays are common and expect to see the occasional mantaray at dusk. Upolu Cay is a naturally formed, unvegetated sand cay situated 30km from Cairns. The cay is governed by the weather patterns and tidal movements, sometimes completely covered by water at high tide, re-emerging at low tide. Surrounded by fringing coral reefs and shallow, protected waters, expect to see giant clams, soft corals, anemone shrimp, sea cucumbers and schools of smaller fish.